Seem to be one of the latest fads in the blogosphere - I want to join in the bandwagon as well, but only I would know that I don't need anymore cards for my collection when there seems to be too much excess. You don't get enough of the cards you need and you are stuck with cards you can't really 'use.' Maybe it is better to let others do the ripping, no matter how tempting it is to try and do some on your own. Redemptions - I'd like to bust old wax of 'recent vintage,' but if there is a chance of pulling one in a product release a year or so ago, then it has to be an obvious deal breaker. Condition and tampering - I'm wary of any unopened product because even for old-school breaks of negligible value, it happens where cards can get damaged or you get bupkis because of some shady things happening with the boxes. Card quality - I don't care if they are worth basically the same these days, but I'd rather go through a old school [err junk box] of something I remembered as pseudo premium from the mid 1990s [1992 Fleer Ultra, 1993 Bowman, 1994 Fleer Flair, etc], rather than the products from mid through late 1980s [1986 Topps, 1987 Topps, 1988 Donruss, 1989 Score, 1989 Topps, etc]. Quality of card images - is it a brand where I can have a lot of card images to go through? If you aren't going to pull anything of value, why not bust a product that has at least quality images [i.e. old Upper Deck product, maybe late 1990s Fleer Ultra]. Value - for an old-school break, anything over $30 is probably pushing it for a product whose demand has waned since its release. Cards - do I get a lot of cards to go through with my break? You don't want to be swimming in cards, but you want to be able to go through a number of them if possible. Hits - for recent old school product, how many hits do I get per box [one, two, three or more] and what is the breakdown [one autograph, one game-used card, one dual, et al]? Do the typical hits out of the box make it worth getting? Reality check - what am I really going to get and will I be satisfied? Is the product a 'has-been' product or one that still matters? Travis Hall points to the sky after an apparent sack. It looks like Zack Thomas just gave Dorsey Levens a licking, but at least you can see Levens securely clutching onto the pigskin. The question is whether Strahan would ever do Brett [Favre] like this to Drew Bledsoe? Sacks the quarterback in triumph and lingers over his prey. 1999 Topps #107, 1998 Topps Stadium Club #27, 2004 Fleer Ultra #6 and 1995 Topps #103 - It is one thing to delve into the world of baseball cards looking for some nice action shots, but it seems almost too easy to find cards from other sports, where the action screams at you. I'm a casual football fan at best and don't actively collecting football cards, but these cards are favorites of mine. 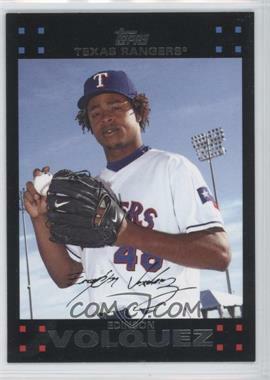 2008 Topps Series II Trading Card History #TCH 65 - I'll let the card speak for itself. I'm not going into depth about the history of the card design, like a favorite blogger has done for some of the other cards in the set, but I enjoy the old-school graphics of trading cards from years past [though for various cards, fonts and other 'design elements' seem to be a little off from the originals]. 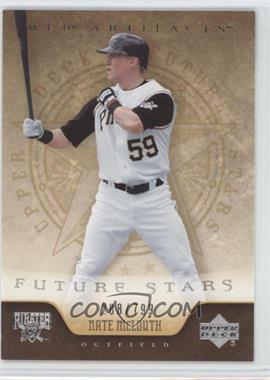 Cincinnati Reds uber prospect Jay Bruce goes 3-for-3 in his Major League debut on May 27 2008. The posterboy for a pitcher being able to handle the bat is Arizona's Micah Owings. He is probably known for his hitting ability as much as his pitching ability. 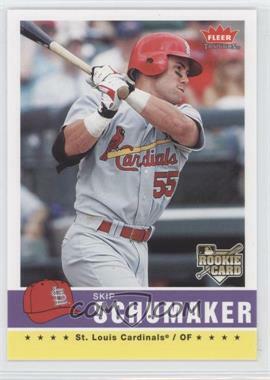 The St. Louis Cardinals' Rick Ankiel also has a feel for hitting the ball, though he is strictly a position player these days and it is almost too painful to learn how he got to be where is he as the Cardinals' starting center fielder. Over the years, a pitcher hitting or a pitcher doing a 'non-hitter' thing have been captured on various cards. Unless they were two-way players at some point of their baseball lives, I think a lot of pitchers' hitting ability to swat a baseball has to do with luck, since it isn't their main focus. They have to do the little things, like be able to get the bunt down and move the runner over, but it isn't like you would pay to watch pitchers hit during BP as a whole. Not even Greg Maddux and Tom Glavine's best efforts will take attention away from those who hit long balls for a living. Even if these hitters' home run numbers are riddled with mental asterisks. 1994-95 Upper Deck #155 - the shorts he's wearing just scream out at you in this image and I think they are known as Zubaz. I think he is taking a photo op to show off his new threads, but that isn't what we're focused on. His shorts look ridiculous, but I digress. 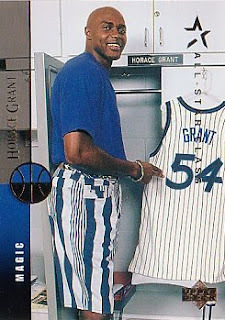 I guess, he's the professional athlete [or was the professional athlete] and the rest of us are just looking on [and cracking on his choice of shorts back in the mid 1990s]. I've had various philosophies over common cards - every card was worth something as I was desperate to pick-up cards here and there. In reality however, I was getting too many scrap cards that I was never going to use for anything [like getting randomly autograph in-person or through the mail]. You come across many 'stragglers,' you can't begin to know where to start as far as putting meaning to them. So, instead of trying to polish the turds - you have to try and systematically flush them down the toilet. I'm hoping to fill a box full of cards [maybe around 5,000 cards in a computer paper box] - before one of the charity organizations comes by and picks the stuff up. My father has done it recently, discarding books, why can't I do it with cards? It is kind of a sad commentary of the cycle of hoarding stuff - but I've got to cut bait, make a decision on cards I don't really need. It maybe a cosmetic fix, but I'm trying to lighten the load so I have more time to spend on cards I like looking at and can actually use. Cards of individual players - most of the time, cards just pile up for particular players. Sometimes I still have unsigned cards of subjects I've recently gotten successful autograph requests from in the mail and I'm not typically going to write someone over and over. For subjects I may see in-person or want to send an autograph request to, I may have too many cards and need to whittle it down to only the cards I really want signed. Multiplayer cards - they are neat to try and get signed by the player's pictured, but I've decided to dump many of the unsigned ones I come across. If you get one player to sign one, then you have to worry about getting the other players' autographs. I'm not looking forward to doing more [unless I can do them at the same time]. Non-sport cards - I've come across some oddball cards fitting this category. You can all have them, because I don't want them. Promos and other giveaway type cards - Sports Illustrated for Kids cards, et al are worthless to me unless they picture an athlete I care about. Hey, I admit I grabbed my share of cards just to have them, and have only have admitted [eight or nine years later] they are pretty much worthless. Off-condition cards - cards with nicks and dings, often minor, some damaged out of the pack, some handled a bit too much. Other sports cards - I dabbled in other sports cards and it is funny to think about the dreck you've come across like 1990-91 Skybox basketball and 1996-97 Upper Deck Collector's Choice. I collected hockey? Who the flipping F are these football guys? A lineman here, a defensive tackle there, a backup QB there. Cards of deceased players - I bought packs of the 1991 Topps Archives set  and found maybe a couple to send off for an autograph request [maybe five years ago], with the rest of the players having passed on. Commons - like I'll need five or six cards of a guy whose career I was barely aware of. Baseball star cards - I get so many that I want to throw every other card away, especially if they are subset cards or ones I can't get autographed because the player doesn't sign enough to make it worthwhile just to get a card signed. I've tossed out some modern retro cards of retired players because certain ones want so much to sign anything. Obscure baseball players - I've given upon actually sending autograph requests to a selected number of guys pictured on Major League and minor league cards. Most of the cards I've collected are from the 1990s with a few stragglers from other decades. If you're a never-has been who played in the minors during the 1990s or played sparingly in the Major Leagues as a reliever/utility infielder/back-up, then you are too damn obscure to possibly track down and send an autograph request to. A showcase of some of the finest baseball memorabilia probably puts 95 percent of anyone who collects anything sports related to shame. The Boston Red Sox have become the charmed organization during the early part of the 21th century. Every story becomes a feel-good episode, like cancer survivor Jon Lester's no-hitter. The last two no-hitter thrown by 'kids' on their pitching staff [Clay Buchholz in 2007 and in 2008] only adds to the team's collective middle finger for their years of relative futility [looking for a championship] and playing second fiddle to the New York Yankees [having won 26 championships]. For the last decade, the Red Sox are the chic team to root for, while Yankees' fans are left pining for the days when their tickets were punched to the World Series each year - the Red Sox have enjoyed their run, winning two championships in the last four years. They've enjoyed a mix of stars and guys who aren't really stars, but have contributed otherwise - Dave Roberts, Mike Lowell, Johnny Damon Kevin Millar, 'up-and-down' Manny Ramirez, Papi Ortiz, Pedro, Jason Varitek, Tim Wakefield, Kevin Youkilis, Josh Beckett, [a lot of times, a blowhard] Curt Schilling, et al. Besides veterans - the Red Sox have a solid core of young guys led by second baseman Dustin Pedroia. They have Buchholz and Lester on the pitching staff, followed by guys like Jacoby Ellsbury and eventually young prospects like Jed Lowrie and Justin Masterson. As far as the Yankees' organization is concerned, their pedigree cannot be matched and they've won 26 championships - but as far as the Yankees' fans gloat about 26, they are only truly concerned about the last year they've won a championship, which hasn't happened since 2000. One of these years, there will be a day late in October where A-Rod will be interviewed because he won the World Series MVP award - the media will talk about him finally getting his just due, but in reality, it isn't happening anytime soon. Derek Jeter may play until he gets 4,000 hits, the Yankees can always buy their way into contention [that is why you don't count them out, not that they've been the greatest organization in the Major Leagues], pick up salaries [Kevin Brown, Roger Clemens, Randy Johnson] left and right, but nothing is going to help them, unless their 'kids' suddenly get right [Ian Kennedy and Phil Hughes] and Joba the eventual starter can give them the shot in the arm. Last Saturday, I picked up a blaster box of 2008 Bowman [$19.99 at Target] - the smaller blaster boxes are much compact and nicer than the older ones. The bump in the road [with the blasters] was after talking about the BC autographs, I realized there were no odds listing for a Bowman autograph and realized it was probably a hobby only hit. Regular Bowman isn't the popular Bowman Chrome and/or very popular Bowman Draft. Still, the product features Bowman Chrome autographs of Matt LaPorta, Jason Heyward and Josh Vitters among others. 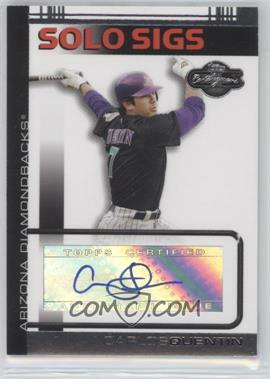 Even though those players had 2007 first-year autographs [in Donruss Elite Extra Edition, Bowman Sterling], it will be their first Bowman Chrome autographs - will that distinction matter since for the key prospects, it won't really be their first year cards or are people deluding themselves into thinking these will be key cards if any of these players break out or since everyone loves Bowman Chrome, it will not matter as much [especially for any related parallels]. The borders around the base cards make it appear like a TV screen and while 2008 Bowman is similar to past years' designs [black borders] - the veteran cards are framed with an inner red border, while the MLBPA logo rookie cards are framed with an inner green border. Veteran cards [particularly stars] don't interest me because I already have too many of particular players - I can't get them randomly autographed in-person/through the mail as easy as young prospects and/or a rank-and-file player. Bowman prospects - Bowman has been Bowman for the last decade with a number of first-year player rookie cards. This year maybe the first to distinguish the prospect cards from the other cards, even though they are numbered differently anyway. The outer border of the prospect cards being white and the image framed with a light blue border/graphic. My best pull out of the box was a Jonah Nickerson gold refractor serial #'d 30/50 - though the card is off-center just a little bit, it could have been worse. 1.) I think the card companies left on the block gouge the consumer - you have these boxes for $75 or more and you know the only thing in them are token hits i.e. maybe common GU cards and common AU cards [featuring no-name rookies]. I'm not going to say what anyone wants to bust, but busting boxes to pull single-swatch jersey cards, maybe a couple of autographs and a patch card of a lousy player isn't my centerpiece 'activity' in my collecting life. 2.) At a card show I was at over the weekend, I dug through some commons bins in order to look for unique cards - it dawned on me that a lot of brands of really nice looking cards were conceived and printed through the late 1990s. I was enamored by the featured premium quality technology [glossy, foil stamping], graphics, full-bleed images that told the story. 3.) You probably would have never seen these cards if you weren't standing there at that moment, flipping through them - you end up realizing however, since these cards are so 'old' [i.e. from years like 1994 Upper Deck Collector's Choice, 1997 Topps Stadium Club, 1998 Fleer Tradition, 1998 Fleer Ultra, 1998 Upper Deck, 1999 Fleer Tradition, 1999 Fleer Ultra, 2000 Fleer Ultra and 2001 Fleer Ultra] and years have gone by so fast already. I'm sure someone busted them for something back in the day - but I got the sense these cards are about as worthless to collectors as those printed during what seemed to be the the golden years[1986-1991] of overproduction. 4.) I ended up picking up an initial 75 cards for $3 - was bored and eventually got around to picking up another 75 cards [maybe two extra] for $2 [looks like the guy at the table shaved off a buck from the total]. 5.) For some collecting topics, the cards and/or players fitting the criteria don't always appear to be obvious - you have to scrutinize every card, because you don't want to miss one you can add. You have fun, you scan them, you put them in a database and there is your hobby. These days, we all want hits, but sometimes it is nice to be a little low-end, a little retro, get something good and plenty. 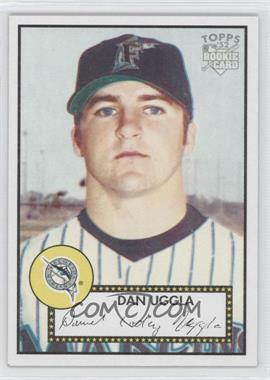 Though Pose made it to the Major Leagues as the first batter in Florida Marlins' history, he seemed to be strictly expansion draft fodder. Still his 1993 Upper Deck leaps out at you because it frames the action succintly. You can see Pose has already dirtied his uniform up and you can see the tension in his face as he is trying leg out a triple. He doesn't know where he is going, but he knows the only way to get there is through 100 percent hustle. Scott Rolen was the 1997 National League Rookie of the Year and while things haven't always been good for the third baseman, he's enjoyed an otherwise successful career as a Major League star. He's played hard and he's played hurt. He's won a World Series and depending on how he finishes his career, is probably in the borderline Hall of Fame class. 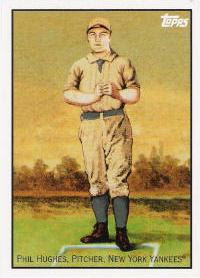 The card is symbolic of his successful career, though it has been a while since he has starred for the Philadephia Phillies. These two cards will never be someone's showcase cards in their collections, but these two have probably become my favorites because of how the photographers were able to capture compellings image of these two players to put into a little hand-held piece of collectible cardboard. 1.) 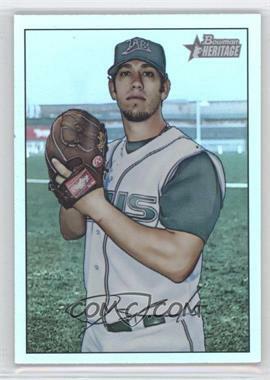 The Tampa Bay Devil Rays [starting pitcher James Shields]- building up their team for the last several years; can anyone think they can keep up once the New York Yankees and Boston Red Sox get their seasons in order? They possess a nucleus of pitching talent to go with a core of future stars. 2.) 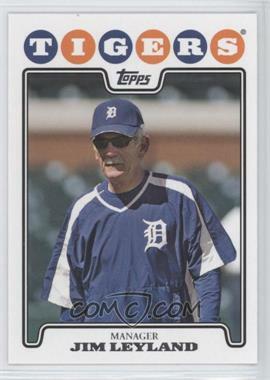 The Detroit Tigers [manager Jim Leyland] - Miguel Cabrera hasn't been doing so bad, but he hasn't been playing with fire, so he gets his share of the blame. A closer look reveals the pitching isn't as good as hoped, either starting or relievers. 3. )Nate McLouth [Pittsburgh Pirates' centerfielder] - runty guy whose time in the gym [along with a quick bat] is paying off with a powerful start [11 home runs in 161 at-bats]. 4. )Carlos Quentin [Chicago White Sox's left fielder] - he's always been a talent, but one frequently injured. He's leading the American League in home runs and if he stays healthy, he'll be a beast. 5.) 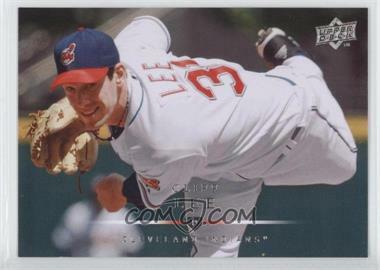 Cliff Lee [Cleveland Indians' starting pitcher] - from pretty good to pretty sucky then to pretty dominant in 2008. 6. )Blake DeWitt [Los Angeles Dodgers' third baseman] - it has only been over 100 at-bats, but despite a brief demotion, really is making Nomar Garciaparra a relic and Andy LaRoche, Dioner Navarro II. 7.) The Florida Marlins [second baseman Dan Uggla] - its not just the $70 million face of the franchise in Hanley Ramirez, but Dan Uggla who has been carrying the load and powering the team to a surprise beginning. 8.) St. Louis Cardinals [outfielder Skip Shumaker] - Tony LaRussa and Dave Duncan absolutely great turning veteran pitchers around [Joel Pineiro, Kyle Lohse, Braden Looper, Todd Wellemeyer, et al but in addition, they've allowed some fringe talent [Ryan Ludwick, Skip Shumaker, Brian Barton] to succeed and contribute along with the 'constant' in Albert Pujols. Centerfielder Rick Ankiel continues to impress with the bat and with his once promising pitching arm. 9.) Ervin Santana [Los Angeles Angels' starting pitcher] - has the 'want it' instead of showing no confidence in his body language. 10.) Edinson Volquez [Cincinnati Reds' starting pitcher] - was traded for Josh Hamilton, who is doing well, but Volquez has turned a corner and has been dominant for the Cincinnati Reds so far.